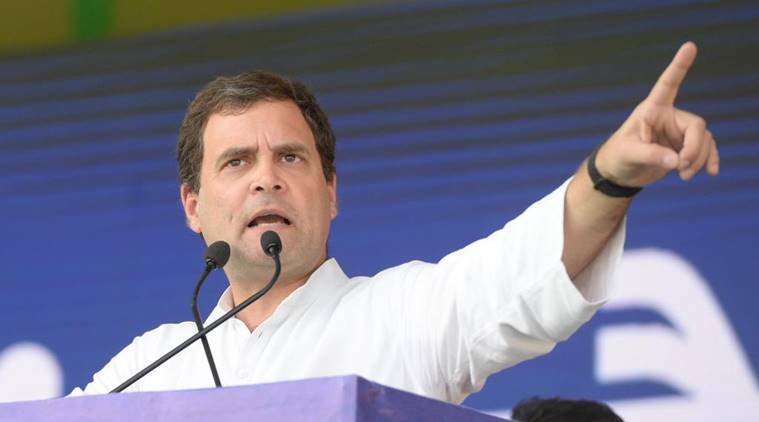 IN A no-holds-barred attack on Prime Minister Narendra Modi, Congress president Rahul Gandhi on Thursday called him a “darpok (coward)” and said “fear” is writ large on his face nowadays. Challenging him to a five-minute debate on any issue, Rahul said Modi would “run away”. Addressing a convention organised by the AICC’s minority department, Rahul also accused the government of trying to place an “RSS man” in all the institutions of the country, including the judicial system and Election Commission. “Have you seen Narendra Modi on TV? Truth cannot be hidden. If you look at him carefully, you can see fear on his face. Narendra Modi has realised that he cannot run the country by dividing India and spreading hatred. India’s Prime Minister should always work for uniting India, and if he does not do that, people will remove him,” said Rahul. “It used to be said five years ago that Narendra Modi has a 56-inch chest and he will rule for 15 years. Today, the Congress party has torn Modi’s reputation to shreds,” he said. Next articleNigerian elections: Has Boko Haram been defeated?